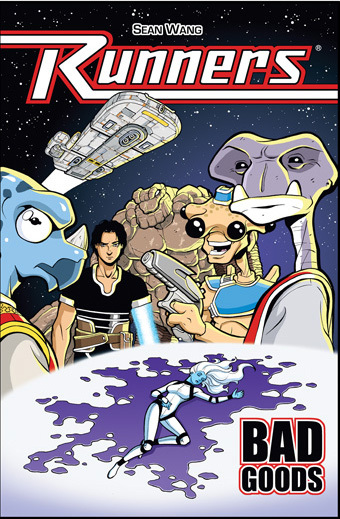 Welcome to the critically-acclaimed sci-fi comic Runners! Here you'll find the first two graphic novels in their entirety, along with bonus behind-the-scenes commentary for most pages. 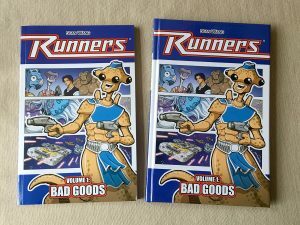 The graphic novels (and other goodies) can also be purchased from the Runners Store. Enjoy the read! It's just another day in the life of reluctant smuggler Roka Nostaco and his ragtag alien crew as they struggle to complete a particularly dangerous run for the mob. Their adventure takes them from shootouts with pirates to ship-to-ship dogfights with ruthless bounty hunters, culminating in an all-out, three-way ship, cycle and foot chase through the streets of an alien space station. All the while, they also have to contend with a vengeful mercenary, a ghost from the past and a mysterious alien girl lying unconscious on their cargo bay floor! Hard times have fallen on Roka Nostaco and the smuggling crew of the Khoruysa Brimia. Tired of scraping by on small-time runs for petty criminals, they take on a big job to get back into the top tier of mob-level work. But high pay comes with high risk, and if the freezing climate of Planet Ciceron doesn't kill them, the hostile native population might. Assuming they don't all kill each other first! Success could put them back on track, but are they in the driver's seat or just pawns in a much bigger double-cross? 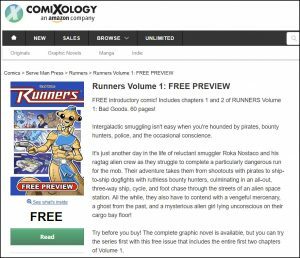 RUNNERS Now Available On ComiXology! I am SUPER excited to announce that RUNNERS is finally available on the digital comic site ComiXology!! The Volume 1 graphic novel is available for purchase, and even better, I also have a FREE preview issue available, which includes the first 2 chapters of the series! 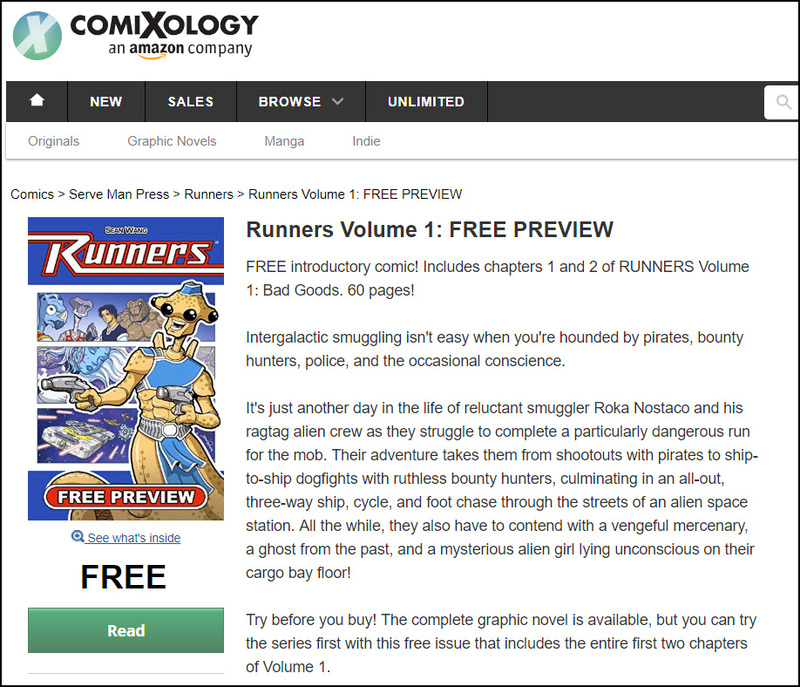 Please help me spread the word: now anyone on ComiXology can try the first 2 issues of RUNNERS for free! And Vol 2 will be coming to the site shortly as well! 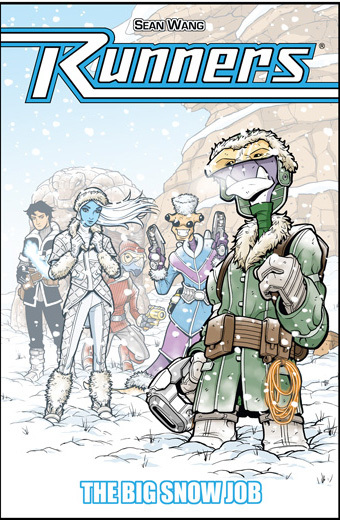 For anyone unfamiliar with ComiXology, you have to BUY the books through their website. Once you buy them, you can read them via the app. I just don’t think you can buy through the app. And through the ComiXology app, you can read the book with their cool Guided View feature, which advances the story panel-by-panel on your device. It makes for a fun new way to read the series other than page-by-page (although that is also an option). You can get the FREE Preview issue HERE. And you can get the full Volume 1 graphic novel HERE. RUNNERS Now Live on Patreon! It’s official: I have launched my ongoing RUNNERS comic project on Patreon! For those unfamiliar, Patreon is kinda like Kickstarter, but instead of making a one-time pledge for a physical product, you back a project’s ongoing creation and are charged a regular monthly amount (although you can cancel, upgrade, or downgrade at any time). Like Kickstarter, there are different tiers, and I will (eventually) be offering different ongoing rewards, including access to the comic at the script, pencil, and ink stages, as well as fully-layered color files. Also, sketchbook pages with commentary and even some polling input on designs. Right now, it is a “soft launch” since Patreon is changing its structure a bit in May. In order to get grandfathered into the current rates, I needed to launch now, before the changes take effect. So I currently won’t be offering the actual rewards. Those will start later this year, once I get through the pre-production phase of Vol 3 and start producing actual pages. In the meantime, the current tiers are just set up as donations. If you are a fan of the series or just feel like supporting me in this endeavor, you can join Patreon (it’s super easy to create an account) and back and any of the tier levels. You’ll be charged that amount at the beginning of every month, but you’ll be helping me finance the long-term production of the series. And later this year, depending on the tier, you’ll be getting access to a number of behind-the-scenes content that will be exclusive to Patreon backers. Thanks everyone! It’s a very exciting time to be a comic creator but still an incredibly uphill battle, as an indie creator, to get the series into financially solvent territory. But I’m excited to get the series going again and keep it going until the full story is told! Check out the RUNNERS Patreon project HERE. Just an update on the printing of my colored RUNNERS Volume 1 book: there’s good news, bad news, and good news again. 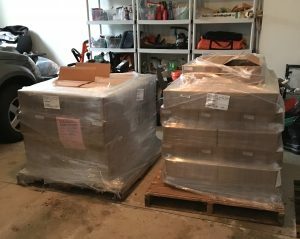 The Good News: about a week ago, the printed books were delivered! The Bad News: Upon reviewing the books, I was super disappointed to see that a lot of pages were oversaturated, throwing the look of the characters off and making those pages too dark overall. I’m not crazy-nitpicky, but it was certainly something that made the art less than it should be, especially as the volume that’s supposed to launch the entire series. And for a year of coloring work and as the book that I’ll be selling for years to come, I just wasn’t happy with the results. For the past week, I’ve been waiting as the printer reviewed their files to see if it was a problem on their end or mine (although I already knew it was not mine). The Good News: I talked to the printer today and they did acknowledge that it was a saturation setting on their end. We discussed options, but ultimately I want to have the run reprinted with the correct color settings. Unfortunately, since they’re schedule is pretty packed, the new run won’t be until June. They suggested that I could fulfill current orders with the books in hand and they’d reprint the remaining, but this didn’t seem fair. 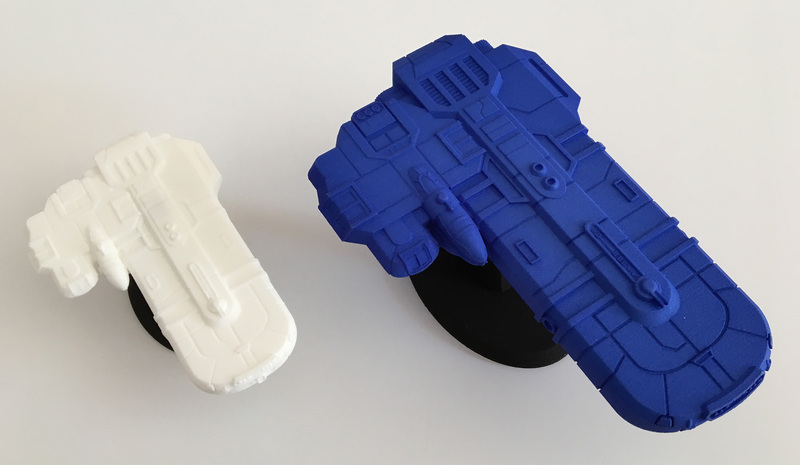 I didn’t want the earliest supporters (Kickstarter backers and pre-sale buyers) to get the “inferior” version now, just to have a better version later. So I guess we all wait. I feel terrible about this on many fronts. I really hate the idea of pulping an entire run of books, but they really fall short of my expectations for the art. I really hate the idea of making people wait even longer to get the books. But I hope everyone will be understanding and find the wait worth it. I want to get people the best possible version of the book, and I hope this next print run will make that possible. On the plus side, the printer has been nice to work with. They also printed my Vol 2 color book a number of years ago, and that was spot-on perfect. I don’t know what happened with this one, but they have been willing to make it right, which is great. Khoruysa Brimia 3-D Printed Ship Now Available!! 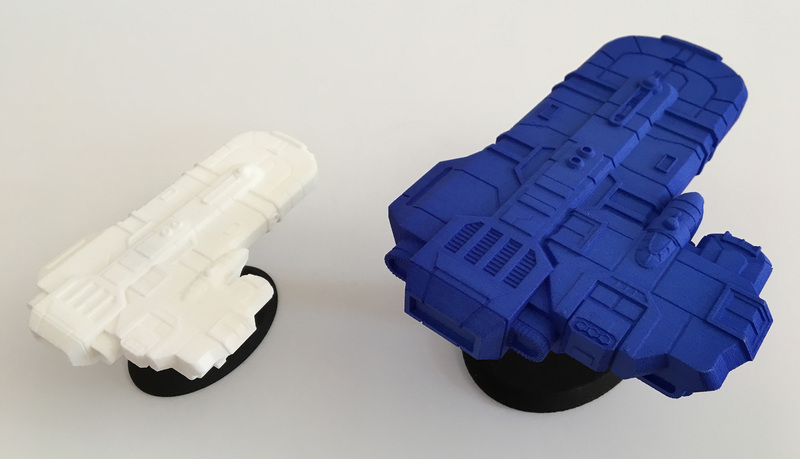 I’ve been waiting a long time to see my RUNNERS ships in 3-D (as have some other people), and now, it is done! 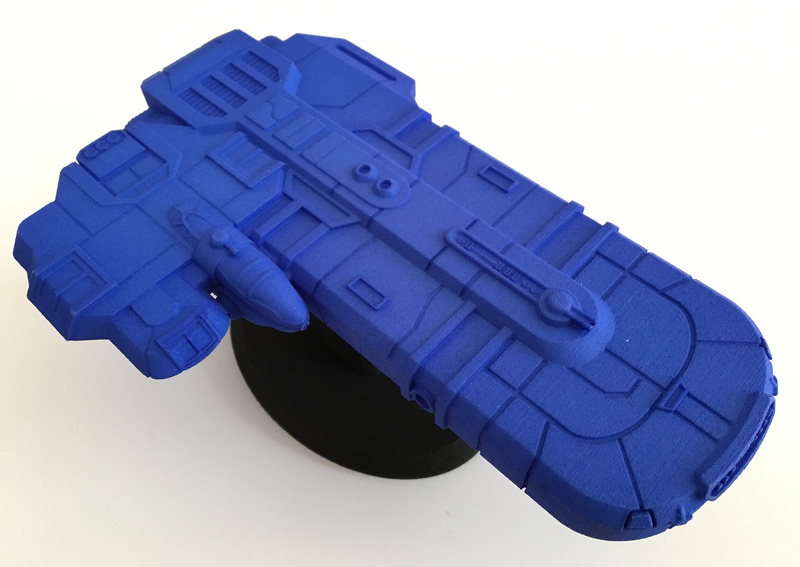 Working from my various drawings, my good friend and amazing 3-D artist David White has sculpted the Khoruysa Brimia, Roka’s smuggling ship from my series! The ship is available in 2 different sizes and multiple material options. The smaller one is 4.75″ long and starts at $35. The larger one is 7″ long and starts at $99. I think the details really shine at the 7″ size, but it looks nice at the 4.5″ size too. The basic material is Versatile Plastic, and the white color comes in Natural, Processed, or Premium finishing. The Natural is a bit rough and grainy, like a fine sandpaper texture, which I’m not crazy about. The Processed is the next level up and is a smoother texture. The difference between Natural and Processed is negligible, so it’s pretty much a no-brainer to go for Processed. Premium is smoother still, but honestly, I don’t necessarily think it’s worth double the price of Processed. The colored plastic is available in Processed finish only, but as I mentioned above, that’s probably my top pick anyway for look and price. There are even fancy Steel options but those are currently outside my budget! Ha ha! I opted for the 4.75″ in white (to review all 3 finishes) and the 7″ in blue. I think the color versions really shows off the detail more than the white. 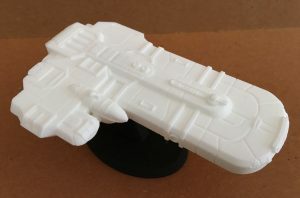 White might be better for painting, but I have not played around with that so I have no idea how the material accepts paint. For each size, the stand is sold separately and plugs into a rectangular hole in the bottom of the ship. For the stand, I think the Natural finish is fine. If you do place an order, it will give you a long delivery time of maybe a month, but in actuality, the turnaround time is much shorter. 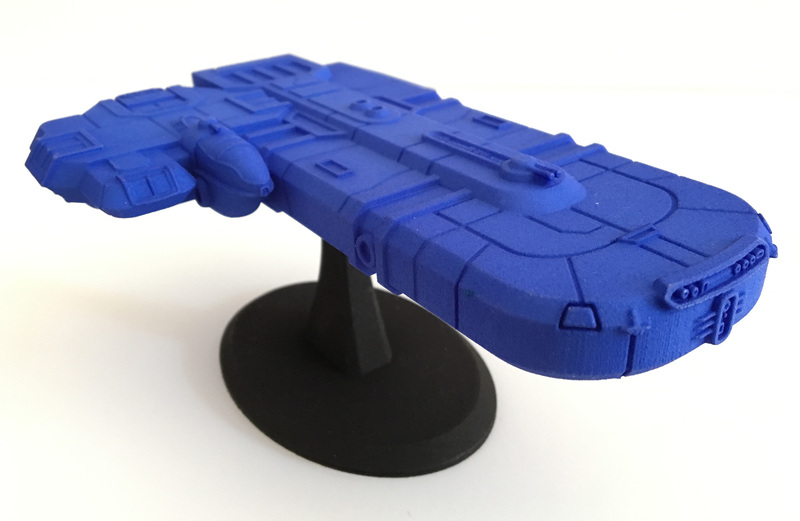 It’s super cool to be able to finally see my ship in 3-D and hopefully it won’t be the last. David really knocked it out of the park with this sculpt! And if you want to see more of his work, which consists mostly of intricately articulated 3-D printed robots, check out his site at www.mechanauts.net!